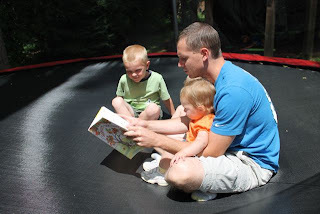 As an aspiring children's picture book author, I often think "Is there anything that could be more exciting than publishing your first picture book?" It would be an awesome feeling all by itself, but wouldn't it be more amazing if your first book release happened the week of your birthday? A book birthday and an author birthday coinciding together would have to be the most exciting thing ever (well, to a book-loving, birthday-celebrating guy like me anyways!). Guess what? It just happened! 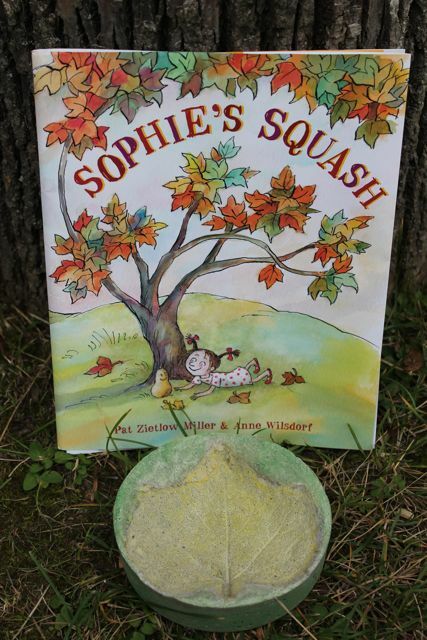 On August 6, 2013, Pat Zietlow Miller's first picture book Sophie's Squash, illustrated by Anne Wilsdorf, was released by Schwartz and Wade and today we celebrate her birthday! There is so much to celebrate today including the high praise that the book has received from Kirkus Reviews, School Library Journal, and many more. 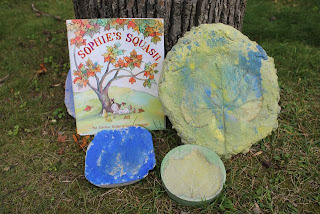 Sophie's Squash was also just named Amazon.com's Picture Book of the Month for August! I have two big birthday memories. One is when I was a kid and my mom made this double-layer chocolate cake. She made it every year, and I always looked forward to it. To this day, chocolate cake is one of my favorite things. The other is from when I was an adult. My husband and brother-in-law surprised me by putting in this lamppost I had wanted. I came home from work, and there it was. That's probably not too exciting for your readers, but it was for me! Sophie's Squash took over five years from the first rough draft to published picture book. During that time it took many years to get the manuscript ready for acquisition and she endured many rejections and numerous revisions. Pat said, "The whole journey taught me that downs, while disappointing, often are replaced by something even better." (Kirby's Lane). In Sophie's Squash, Sophie purchases a butternut squash from a farmer's market and she quickly grows quite fond of the little vegetable (or is it a fruit, or is it both?). 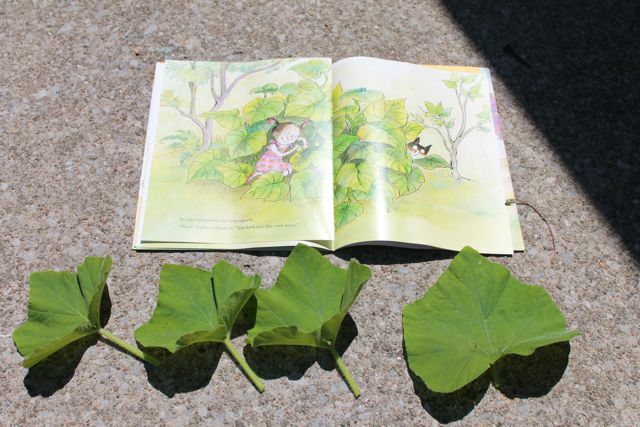 In this story, the butternut squash becomes Sophie's friend, and is named Bernice. She goes everywhere and does everything with Sophie. 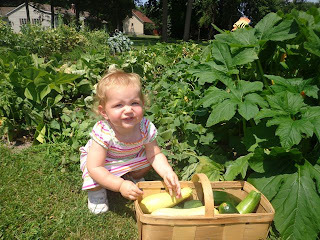 Even with all love from Sophie, Bernice begins to show signs of age as does every squash that goes uneaten. Sophie returns to the farmer's market and hears advice from a wise farmer on how to keep a squash healthy. It is everything Sophie needs to care for Bernice during the coming winter. Bernice greets Sophie the next spring and has quite a surprise for her in time. To begin our birthday celebration activity, my children visited their great-grandparents, two of the wisest farmers we know, and learned how to keep squash healthy. 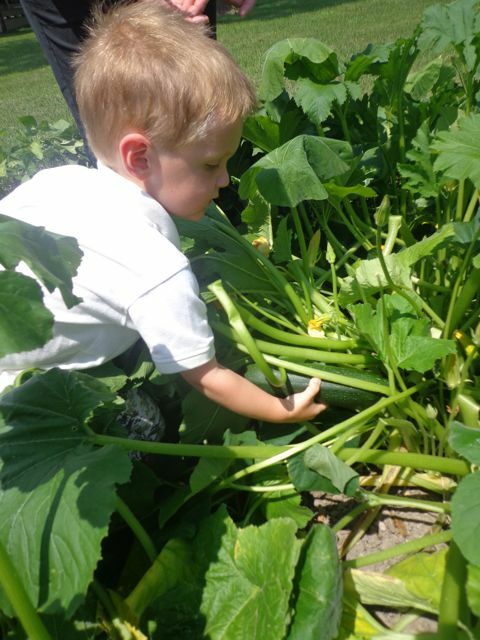 Their garden is always bursting with squash that they are willing to share. My youngest son found a zucchini that was just his size for picking. 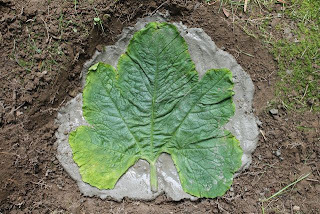 My youngest daughter filled a basket full of zucchini and yellow summer squash while her mom cut many of the giant squash leaves behind her that we would need to make squash leaf prints back at our house. 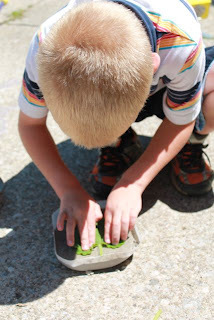 We had a beautiful sunny day to make our squash leaf prints. The kids chose to have me read Sophie's Squash to them on the trampoline before we began the activity. We wanted to make squash leaf prints in cement that would make decorative pieces for our flower beds around our house. 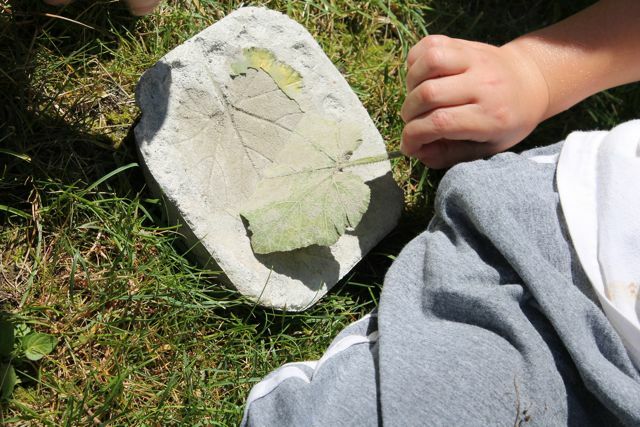 Our initial idea was to dig a hole, pour in the cement, press in the giant squash leaves from great-grandma and grandpa's garden, and then easily remove the cement once it hardened. Well, that didn't happen. Even after almost a week, the cement wasn't completely dry and it wasn't budging from the ground. 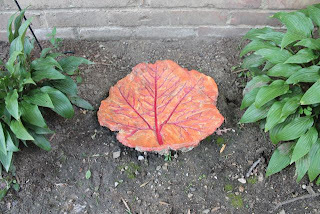 We realized that this idea would have been really cool if we would have dug the hole in the flower bed where we wanted to have decoration, but moving the cemented squash leaf print was not going to be an easy feat. It was time to revise the plan. 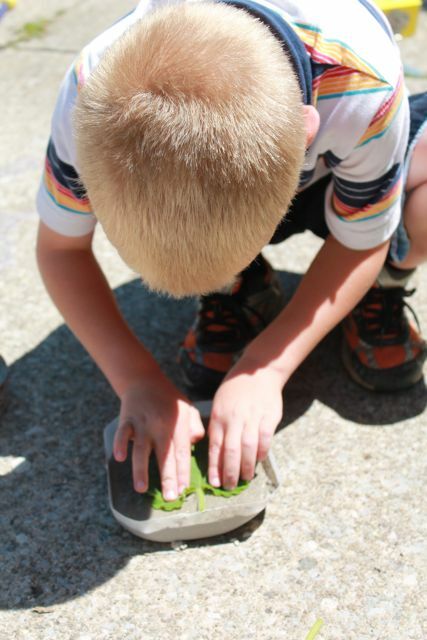 We had used all the squash leaves for the first attempt at our squash leaf prints. 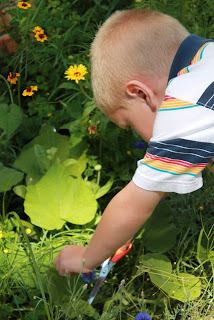 Luckily, we had a pumpkin plant that was growing voluntarily in our wildflower garden. 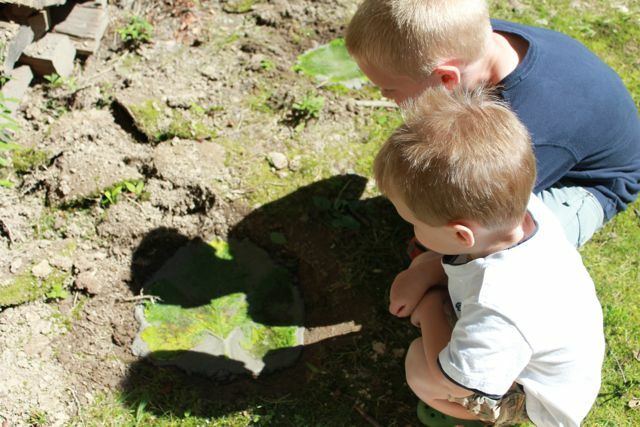 Last year, this spot in our yard was a vegetable garden. We compared the new leaves to the illustrations in the book, and found them to be similar. Then, we poured cement into plastic containers and pressed the leaves in. 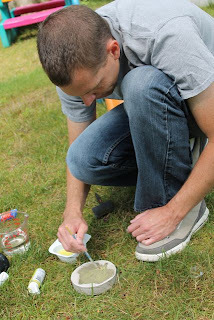 My oldest son knew exactly what to do having done this before. 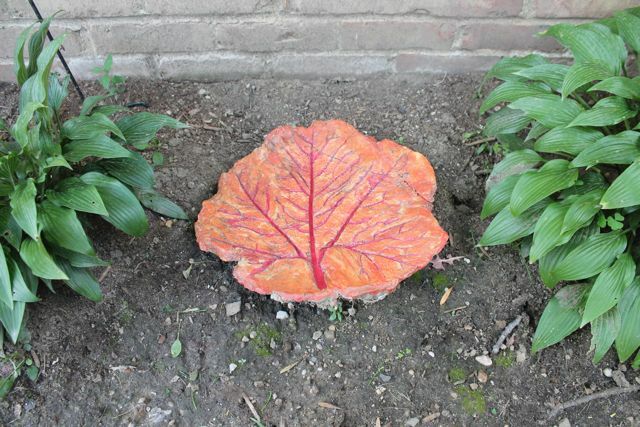 I decided to push my leaf into the cement as much as I could to make a deep impression. I thought the print could catch rain water for bugs and butterflies to drink. 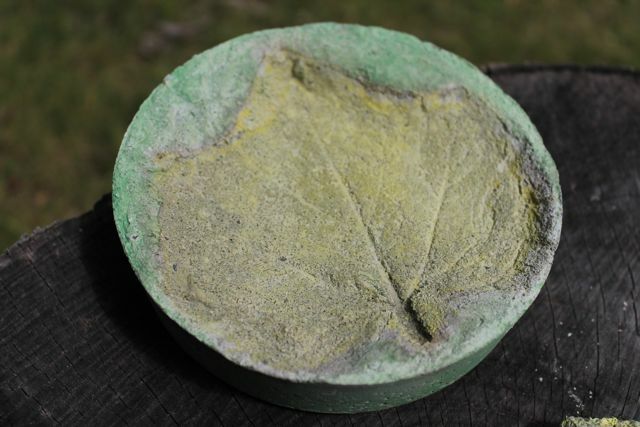 We allowed the squash leaf prints to dry for about three days in the sun to make sure they were completely hardened. 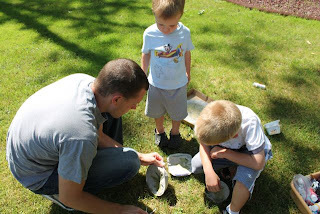 We removed the cement from the plastic containers. 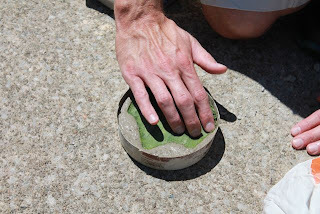 Then, peeled off the squash leaf to reveal the print. My kids and I decided that it would be fun to paint our prints. My youngest daughter painted a squash leaf print that we made with the left over cement by freely forming the cement it into a circle shape before we pressed in the squash leaf. Our squash leaf prints inspired by Sophie's Squash. 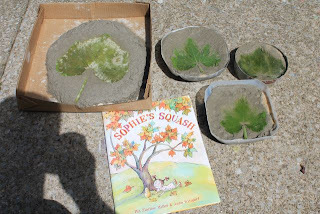 Remember our first attempt at making squash leaf prints? Well, they eventually did harden up and with some work I was able to remove one from the ground. I repaired a piece that broke off, added some paint, and I had another squash print to be proud of. 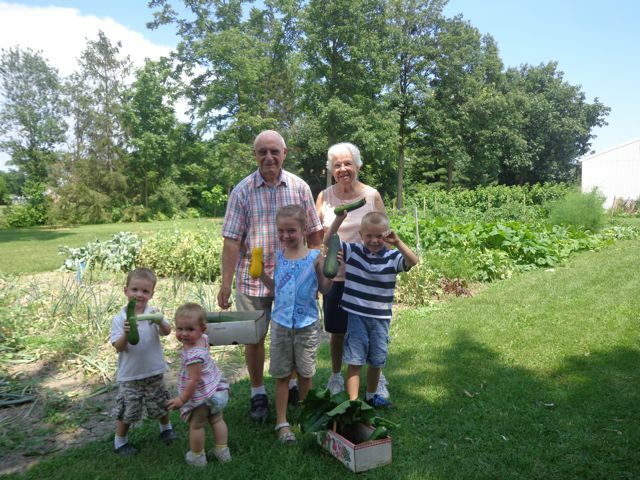 Thank you Pat for sharing your birthday memories and for providing our family the opportunity to experience Sophie's Squash and your birthday together! 1. 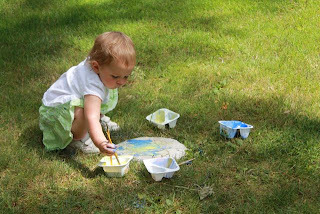 Pat Zietlow Miller's Website and Blog - Read. Write. Repeat.